If you are looking for crispy, aromatic, sizzling and juicy wings, try my Exotic Grilled Honey Wings Recipe. 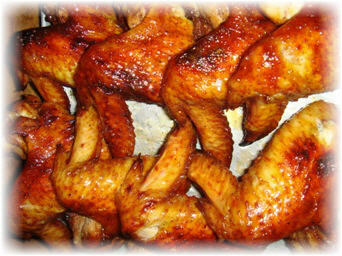 These wings taste especially good as traditional Chinese spices are added give an exotic flavour. 1. Straighten wings using wooden sticks for easy grill. 2. Marinate wings in crushed garlic, ginger slices, pepper, salt, soy sauce, Macadamia Honey and egg for at least 5 hours. 3. Grill wings in oven of 225 degrees Celsius for 15 minutes, then glaze each of them with Macadamia Honey using a baking brush, grill for 10 minutes and turn over to the other side and glaze with honey before grilling for another 10 minutes. 4. Serve while sizzling hot!